How do you raise a progressive kid in Alabama? I don’t know; ask my in-laws, or the parents of my wife’s many lifelong friends who would call themselves “progressive,” almost all of whom graduated from Alabama public schools. How do you raise a progressive kid in the South? Ask my parents; shoot, ask me, since my son just cast his first vote ever last fall, and cast it for Barack Obama. 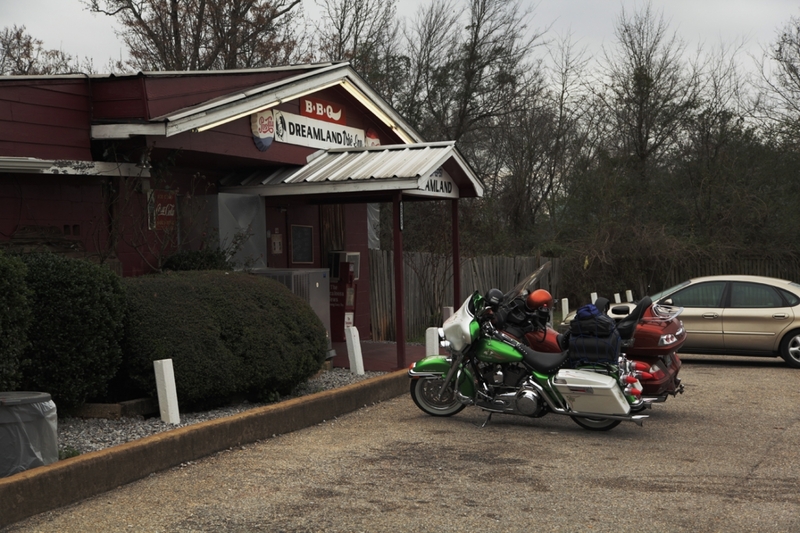 By the way, The Nation: This is not just “A Tuscaloosa BBQ Joint”; this is the original by-God Dreamland. Do a minute of research. Asking how to raise a “progressive” child in the South just points out how specious and superficial such words are. To much of my family across the South, I am the personification of a bleeding-heart liberal – I think gay couples should be able to marry, and gun owners should have to get licensed, and government should provide a strong social safety net. To many of my friends in the Northeast, I’m a DINO (Democrat in Name Only) who’s been a gun owner since I was a child, who’s a big fan of capitalism and free-market enterprise, who has mixed feelings about organized labor, who worships at a Baptist church. Neither my wife’s parents, nor my parents, nor my children’s parents set out to raise a “progressive” child. All of us tried hard to raise thinking children. To some, “thinking” and “progressive” may mean the same thing, but those are the same people to whom “South” and “reactionary” are synonyms, so what do they know? Aronowitz admits that there are “blue dots” in the South, but those dots aren’t just in college towns or metropolitan hubs, and if you take the time and effort to look closely, they aren’t dots, and they aren’t just one of two primary colors. Alabama may be “statistically . . . the most conservative state in the nation,” but I was in Alabama after the April 27 tornadoes ripped across the state, and I saw the long lines of Alabamians (and others from across the South) waiting for their chance to give of their means, their time, and their labor to help their neighbors. As I put it in an earlier post, not all of us who holler, hate. The trick – no, the task – for us Southerners who both love and lament so much about the South, who would hate to leave this land no matter how much it breaks our hearts, who think purple whether we vote blue or red, is to figure out what is most worth holding on to, and how to hold on without being held down. This reminds me so much of when I went to college and grad school in DC/MD. Growing up in SC, I seemed very progressive and worldly to my friends. When I moved up “North” some people saw me as a country bumpkin. Like you, I fall somewhere in between. I am not proud of all that was done in the South or even in this country in general. There are, however, some proud traditions I love and uphold…like good manners and southern hospitality. I also work in cultural tourism and wonder why people want to come visit the south but then act like it’s some backwards pit. Bad things happened and still happen in places other than the south. My personal belief is that you have time to sit and criticize, you have time to do something positive for the world. I think Steph hit the nail on the head. If you have time to sit and criticize, you have time to do something positive for the world. Use the power of your words to share what you are doing to help, rather than to judge others. I’m a half-Yankee transplant. My father was from Memphis and my mother from central Ohio, and I was reared in Manhattan. Fortunately, I was sent to a Quaker school by parents who were Roosevelt Democrats. My father had a near heart attack one evening at the dinner table when I was telling him about a meeting I’d been to with my classmates. I described the boy who had been sitting next to me at the conference table–his reddish hair, pale tan complexion, and gift of gab. Daddy ordered me to resign from the group and never again to have anything to do with them. He was too angry to talk when I asked him why. I had to find out from my mother what had caused this. He probably was aware that I didn’t give up the Interracial Youth Council, but he did give me a wakeup call, I suppose. My point is that even with some ingrained and unchangeable prejudices, most people should not be consigned to black or white, red or blue categories. Even if one ca’t always control one’s feelings, we an all learn to think and weigh evidence and arguments and to be intellectually honest.